Here are Port Everglades hotels near the cruise port catered towards cruise passengers. Covering shuttle services, prices and distance to terminals. Fort Lauderdale has one of the busiest cruise ports in the world and it is known as Port Everglades. Located on Florida’s southeast coast, the port is about 20 miles from the edge of the Everglades National Park which gives the port its name. Port Everglades is 3 miles south of Las Olas, the hub of shopping and nightlife in Fort Lauderdale, 30 miles north of Miami, and about 220 miles southeast of Orlando. If you’re cruising out of Port Everglades, it makes sense to book a hotel near the port either before or after your exciting Caribbean cruise. Some people choose to extend their cruise with a few days of vacation in sunny Fort Lauderdale pre or post cruise. Go shopping, enjoy the beach or spot alligators and wildlife on exciting eco tours and airboat rides in the Everglades. Whether you’re traveling to Fort Lauderdale by road or by air, you should plan to arrive the night before your cruise departs. This gives you some leeway in case of flight delays, bad weather or closed highways. Book yourself a night in a Port Everglades hotel and have peace of mind that nothing will stop you boarding your cruise the following day. Many Fort Lauderdale hotels include free shuttle transfer to Port Everglades cruise terminal and some also include free cruise parking for the duration of your cruise. 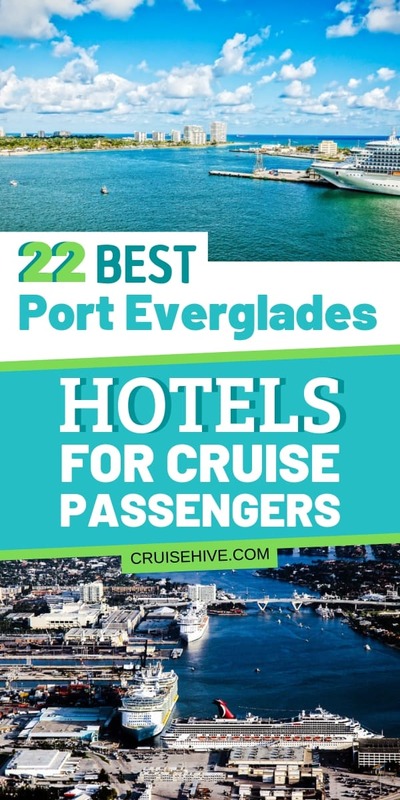 We made a comprehensive list of the closest and cheapest hotels near Port Everglades, including those with free shuttle service to the cruise port. For comparison purposes, we’ve included prices for one night, but please note that prices will vary depending on the date, season, demand and length of your stay. There are plenty of cheap hotels but the lower price tends to reflect the further distance from Port Everglades. You will need to add the price of cruise parking, a taxi or Uber to get to the cruise port as these low-cost hotels near Fort Lauderdale do not have a shuttle service. This budget-priced hotel is 12 miles from Port Everglades on N. University Drive in Plantation. Reviews of the Sawgrass Inn and Conference Center are mixed but the hotel does have a pool, free parking and free internet. Located at 1419 S. Federal Hwy in Hollywood, the Green Seas Motel is a charming southern-style hotel with excellent reviews. It is an 11.5 mile taxi rode or drive to Port Everglades. Air-conditioned suites overlook the pool and include a kitchenette. Richard’s Motel is another Hollywood gem about 7.5 miles from Fort Lauderdale cruise port. Clean air-conditioned rooms have cable TV and free Wi-Fi and there’s a heated pool for a refreshing dip before breakfast. Located on Powerline Rd, the 3-star Fort Lauderdale Grand Hotel has modern air-conditioned rooms in an older building. It is 11.4 miles from Port Everglades and close to the Cypress Creek business district. This family-friendly hotel has a pool, restaurant and fitness center but no cruise shuttle. Situated at 2900 Polk St, 9.2 miles south of Port Everglades, the boutique Hollywood Gateway Inn has been newly renovated. Air-conditioned rooms include a kitchenette, Wi-Fi and free breakfast. It has a beautiful courtyard garden and pool. If you want to stay as close as possible to Port Everglades, pick one of these Fort Lauderdale hotels that are less than 3 miles from the port. An easy 0.8 miles from Port Everglades, the Crown Plaza Fort Lauderdale is located close to the entrance to port at 455 State Road 84 in Fort Lauderdale. This modern hotel has elegantly designed rooms with full amenities including a pool, bar, fitness center, Wi-Fi, air-conditioned rooms and restaurant. For those arriving by air, the Crown Plaza is less than a mile from Fort Lauderdale airport. Park and cruise is $10 per night and shuttle to Port Everglades is $8 per person one way. The Holiday Inn Express on SE 17th St is always popular with guests heading out or returning from a Port Everglades cruise. It is 1.1 miles from the north entrance to Port Everglades so you can book a complimentary shuttle for the short journey. Close to everything it has excellent feedback from past guests. It offers a shuttle to the cruise port for $8 per person and a free 24-hour shuttle to Fort Lauderdale Airport. Great value and a handy location just 1.3 miles from Port Everglades make the Vacation Inn Motel in Fort Lauderdale worth considering. Located at 3101 SE 6th Ave, this clean and comfortable 2-star hotel has an air-conditioned room with refrigerator and microwave. Located right on the waterfront on SE 17th Street in Fort Lauderdale, Pier 66 Hotel and Marina is just 1.4 miles from Port Everglades. Set on 22 acres of tropical gardens with its own exclusive marina, 3 pools, 5 restaurants and a health spa, this resort makes the perfect complement to any luxury cruise. This beautiful luxury hotel is located on SE 10th Ave/17th St, right next to the Convention Center. It is a mere 1.4 miles from Port Everglades, 2 miles from the airport and 2 miles from the beach. Hyatt Place Fort Lauderdale is a 3 star business class hotel with bar, restaurant, fitness center, outdoor pool and shuttle bus service to the port and airport. Well located for cruisers just 1.6 miles from Port Everglades, the Haven Hotel on SE 6th Ave is one of the closest you can get to the cruise port entrance. This 2-star budget hotel dates back to 1937 and was one of the first motels to serve Fort Lauderdale. It has been entirely updated and has air-conditioning, refrigerators and microwaves in all rooms and includes breakfast in the price. If you want a free shuttle service from the hotel to Port Everglades, pick one of the following Fort Lauderdale hotels. Just 3.5 miles from Port Everglades, Rodeway Inn and Suites is on Marina Mile Blvd just off the I-95 Exit 25. The hotel has very good reviews and is excellent value with free breakfast, fitness center, pool and free Wi-Fi. For cruisers, it includes free Park and Cruises deals and free transfers to Port Everglades. The Ramada Fort Lauderdale is located just west of I-95 Exit 25 on Marina Mile Blvd (S.R.84) 3 miles from Port Everglades. This upscale hotel has comfortable rooms, complimentary breakfast, restaurant, bar and gym. Best of all, it offers free shuttle to Port Everglades and/or to the airport, making it a great value option. Located in Dania Beach, 6 miles from Port Everglades, the Courtyard by Marriott is a luxury hotel with air-conditioned rooms and family suites. Prebook a seat on the free cruise shuttle bus. After a good night’s sleep, hop aboard and be transported easily right to Port Everglades for your cruise departure. Just 1.3 miles from Port Everglades cruise terminal, Four Points by Sheraton has a free shuttle service to and from the airport and the cruise port. Newly renovated, this beautiful hotel has 42-inch TVs. Wi-Fi and refrigerators in all rooms along with a fitness room and outdoor pool. This 3-star hotel at 1120 West State Road 84 welcomes extended stay guests. Just 2.1 miles from Port Everglades cruise port and close to the Southland Shopping Center, Candlewood Suites Fort Lauderdale provides shuttle transfers to the cruise port for $8 per person and free shuttle transfers to and from the airport. Rooms are pet-friendly and include kitchenettes. Just over a mile from Port Everglades, the affordable Crown Inn is located at 1900 S. Federal Hwy. This budget hotel has air-conditioned rooms, complimentary breakfast buffet and free Wi-Fi. It offers a free shuttle to the airport and charges around $10 for pre-booked shuttle transport to Port Everglades cruise terminal. Just one mile from Port Everglades, this top cruise hotel in Fort Lauderdale is just 1.6 miles from the airport. Located at 1450 SE 17th St, the Extended Stay America Hotel is modern and spacious – ideal for longer stays in this beach city pre or post cruise. It includes a grab-and-go breakfast buffet in the price and has a business center, air conditioning and shuttle bus service to the port ($4 per person) and free airport shuttle. Beach lovers can walk to the beach from the Best Western Plus Oceanside Inn which is located 100 yards from the sand on 1180 Seabreeze Blvd, Fort Lauderdale. It has family rooms, a heated pool, gym and free breakfast in the room rate. Port Everglades is 2.3 miles away and cruise shuttle transportation is $8 per person. Located on the Intracoastal Waterway with water views in all directions, the Hilton Fort Lauderdale is just one mile from the cruise port. This modern four star hotel has comfortable air-conditioned rooms, gym, restaurant and stunning views through floor-to-ceiling windows. You might be able to see your cruise ship from your room! Located on SE 17th St, Embassy Suites Fort Lauderdale is an all-suite hotel for those who like comfortable living space and a separate bedroom. It has an outdoor pool, fitness room and free hot breakfast for guests. The AAA 3-Diamond-rated hotel offers shuttle transfers to and from Port Everglades for $9 per person one way. This four star luxury hotel on State Road 84 will ensure a perfect relaxing stay before or after your Port Everglades cruise. Renaissance Hotel Fort Lauderdale is one mile from the port. The hotel has a restaurant, pool and bar and well-appointed rooms. The nearby Water Taxi stop puts everything within easy reach. Once you’ve booked your hotel near Port Everglades, check out all the things that Fort Lauderdale has to offer. Spend time on the golden sandy beach, shop at La Galleria, dine along Las Olas and visit some of the state parks, animal attractions, historic homes and gardens in the area. If you’re stuck for ideas, download this $4.99 ebook of Days Out Around Fort Lauderdale for what to do and where to eat in Fort Lauderdale before and after your Port Everglades cruise. You’ll have a blast!